Lilium ‘Tiny Double You’ developed in the Netherlands. Bred originally for containers, these are versatile garden plants as well. Lilium ‘Tiny Double You’ is dwarf version of upfacing double orange flowers. Lilium [members of which are true lilies] is a genus of herbaceous flowering plants growing from bulbs, all with large prominent flowers. Lilies are a group of flowering plants which are important in culture and literature in much of the world. Most species are native to the temperate northern hemisphere, though their range extends into the northern subtropics. Many other plants have “lily” in their common name but are not related to “true” lilies. Asiatic hybrids [Division I]: These are plants with medium-sized, upright or outward facing flowers, mostly unscented. These are based on Lilium dalhansonii, Lilium hansonii, Lilium martagon, Lilium medeoloides, and Lilium tsingtauense. The flowers are nodding, Turk’s cap style [with the petals strongly recurved]. These are mostly taller growing forms, originally derived from Lilium bolanderi, Lilium × burbankii, Lilium canadense, Lilium columbianum, Lilium grayi, Lilium humboldtii, Lilium kelleyanum, Lilium kelloggii, Lilium maritimum, Lilium michauxii, Lilium michiganense, Lilium occidentale, Lilium × pardaboldtii, Lilium pardalinum, Lilium parryi, Lilium parvum, Lilium philadelphicum, Lilium pitkinense, Lilium superbum, Lilium ollmeri, Lilium washingtonianum, and Lilium wigginsii. Many are clump-forming perennials with rhizomatous rootstocks. These are cultivated forms of this species and its subspecies. They are most important as plants for cut flowers, and are less often grown in the garden than other hybrids. This group includes hybrids of many Asiatic species and their interspecific hybrids, including Lilium × aurelianense, Lilium brownii, Lilium × centigale, Lilium henryi, Lilium × imperiale, Lilium × kewense, Lilium leucanthum, Lilium regale, Lilium rosthornii, Lilium sargentiae, Lilium sulphureum and Lilium × sulphurgale. The flowers are trumpet shaped, facing outward or somewhat downward, and tend to be strongly fragrant, often especially night-fragrant. These are based on hybrids within Lilium section Archelirion, specifically Lilium auratum and Lilium speciosum, together with crossbreeds from several species native to Japan, including Lilium nobilissimum, Lilium rubellum, Lilium alexandrae, and Lilium japonicum. They are fragrant, and the flowers tend to be outward facing. Plants tend to be tall, and the flowers may be quite large. The whole group are sometimes referred to as “stargazers” because many of them appear to look upwards. All natural species and naturally occurring forms are included in this group. Family: Cupressaceae; Bloom Description: Non-flowering; Leaf: Colorful, Evergreen, Winter Interest, Crushed foliage is aromatic. 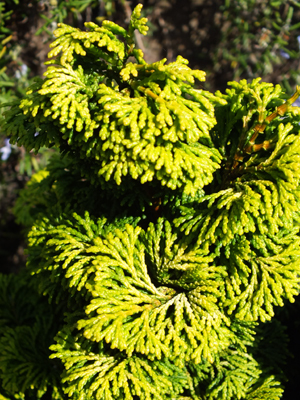 ‘Lynn’s Golden’ is a dense evergreen shrub with a pyramidal form that grows slowly to 3-4′ tall during the first 10 years. It is noted for its golden yellow foliage. Foliage acquires purple tones in winter. Chamaecyparis obtusa [Japanese cypress, hinoki cypress or hinoki] is a species of cypress native to central Japan. It is a slow-growing tree which grows to 35 m tall with a trunk up to 1 m in diameter. The bark is dark red-brown. The leaves are scale-like, 2-4 mm long, blunt tipped (obtuse), green above, and green below with a white stomatal band at the base of each scale-leaf. It is a popular ornamental tree in parks and gardens, both in Japan and elsewhere in temperate climates, including western Europe and parts of North America. Over 200 cultivars have been selected, varying in size from trees as large as the wild species, down to very slow-growing dwarf plants under 30 cm high. Very nice small [dwarf] maple that will grow much wider than tall, forming a low mound with age. ‘Shishio hime‘ emerges in spring with Red tips to the leaves before turning green for the summer. 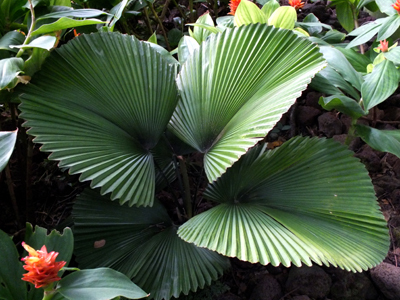 The leaves become smaller each year as the plant matures. 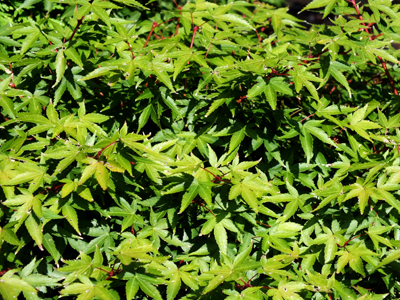 Older specimens have some of the smallest leaves of any Acer palmatum. The foliage is also extremely dense. Fall color ranges from red and yellow to orange. Acer palmatum, called Japanese Maple or Smooth Japanese Maple is a species of woody plant native to Japan, North Korea, South Korea, China, eastern Mongolia, and southeast Russia. Many different cultivars of this maple have been selected and they are grown worldwide for their attractive leaf shapes and colours.